Reading and share top 25 famous quotes and sayings about Math And Life by famous authors and people. Browse top 25 famous quotes and sayings about Math And Life by most favorite authors. 1. "(1) Use mathematics as shorthand language, rather than as an engine of inquiry. (2) Keep to them till you have done. (3) Translate into English. (4) Then illustrate by examples that are important in real life (5) Burn the mathematics. (6) If you can't succeed in 4, burn 3. This I do often." 2. "Her husband once said that he believed some sort of mathematical equation could be applied to life - since the longer you lived, the greater its seeming velocity. She always attributed this to familiarity. If you kept the same habits - and if you lived in the same place, worked in the same place - then you no longer spent a lot of time noticing. Noticing things - and trying to make sense of them - is what makes time remarkable. Otherwise, life blurs by, as it does now, so that she has difficulty keeping track of time at all, one day evaporating into the next." 3. "When there were no customers, he thought about geometry. He tried to perform the Pythagorean Theorem on the light fixture above him, given his estimate of its circumference, but he failed. He wanted to be good at math. But he just wasn't. He wanted so badly for the math club to accept him, but to them he was a loser. During rush week they battered him blue with yard sticks; they tied him to a table naked and made him prove problems involving half circles before a huge swinging protractor cut him in half; they forced him to continually calculate the remaining volume of the kegs he had to drink, working it out by hand as he was held upside down. After he didn't get in the club, they had started ganging up on him every day, sticking his head in the toilet and stealing his lunch money. Business was slow at the moment, and he thought about ending his life in the kitchen appliance aisle." 4. "From the age of 13, I was attracted to physics and mathematics. My interest in these subjects derived mostly from popular science books that I read avidly. 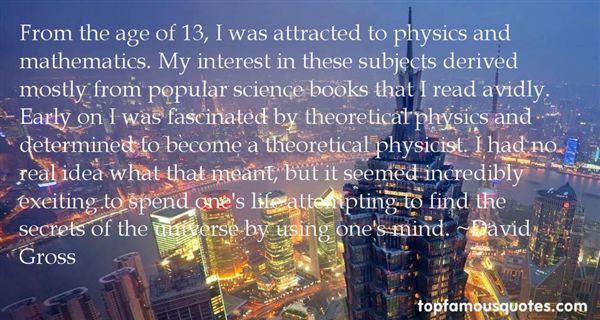 Early on I was fascinated by theoretical physics and determined to become a theoretical physicist. I had no real idea what that meant, but it seemed incredibly exciting to spend one's life attempting to find the secrets of the universe by using one's mind." 5. "A man may possess a profound knowledge of history and mathematics; he may be an authority in psychology, biology, or astronomy; he may know all the discovered truths pertaining to geology and natural science; but if he has not with this knowledge that nobility of soul which prompts him to deal justly with his fellow men, to practice virtue and holiness in his personal life, he is not truly an educated man.Character is the aim of true education; and science, history, and literature are but means used to accomplish the desired end. Character is not the result of chance work but of continuous right thinking and right acting." 6. "It is almost as if ideas set in mathematical form melt and become liquid and just as rivers can, from the most humble beginnings, flow for thousands of miles, through the most varied topography bringing nourishment and life with them wherever they go, so too can ideas cast in mathematical form flow far from their original sources, along well-defined paths, electrifying and dramatically affecting much of what they touch. pp. xii - xiii." 7. "Immortality is often ridiculous or cruel: few of us would have chosen to be Og or Ananias or Gallio. Even in mathematics, history sometimes plays strange tricks; Rolle figures in the textbooks of elementary calculus as if he had been a mathematician like Newton; Farey is immortal because he failed to understand a theorem which Haros had proved perfectly fourteen years before; the names of five worthy Norwegians still stand in Abel's Life, just for one act of conscientious imbecility, dutifully performed at the expense of their country's greatest man. But on the whole the history of science is fair, and this is particularly true in mathematics. No other subject has such clear-cut or unanimously accepted standards, and the men who are remembered are almost always the men who merit it. Mathematical fame, if you have the cash to pay for it, is one of the soundest and steadiest of investments." 8. "The world is a multiplicity, a harvest-field, a battle-ground; and thence arises through human contact ways of numbering, or mathematics, ways of tillage, or agriculture, ways of fighting, or military tactics and strategy, and these are incorporated in individuals as habits of life." 9. "The habit of looking at life as a social relation — an affair of society — did no good. It cultivated a weakness which needed no cultivation. If it had helped to make men of the world, or give the manners and instincts of any profession — such as temper, patience, courtesy, or a faculty of profiting by the social defects of opponents — it would have been education better worth having than mathematics or languages; but so far as it helped to make anything, it helped only to make the college standard permanent through life." 10. "I do believe in simplicity. It is astonishing as well as sad, how many trivial affairs even the wisest thinks he must attend to in a day; how singular an affair he thinks he must omit. When the mathematician would solve a difficult problem, he first frees the equation of all incumbrances, and reduces it to its simplest terms. So simplify the problem of life, distinguish the necessary and the real. Probe the earth to see where your main roots run." 11. "Seldon, Hari—It is customary to think of Hari Seldon only in connection with psychohistory, to see him only as Mathematics and as social change personified. There is no doubt that he himselfEncouraged this for at no time in his formal writings did he give any hint as to how he came to solve the various problems ofPsychohistory. His leaps of thought might have all been plucked FromAir, for all he tells us. Nor does he tell us of the blind alleysInto which he crept or the wrong turnings he may have made.…As for his private life, it is a blank. Concerning his parent and Siblings,We know a handful of factors, nor more. His only son,Raych Seldon, is known to have been adopted, but how thatCame about is not known. Concerning his wife, we onlyKnow that she existed. Clearly, Seldon wanted to a cipherExcept where psychohistory was concerned. It is as though he felt--Or wanted it to be felt—that he did not live, he merely psychohistorified." 12. "In using the present in order to reveal the past, we assume that the forces in the world are essentially the same through all time; for these forces are based on the very nature of matter, and could not have changed. The ocean has always had its waves, and those waves have always acted in the same manner. Running water on the land has ever had the same power of wear and transportation and mathematical value to its force. The laws of chemistry, heat, electricity, and mechanics have been the same through time. The plan of living structures has been fundamentally one, for the whole series belongs to one system, as much almost as the parts of an animal to the one body; and the relations of life to light and heat, and to the atmosphere, have ever been the same as now." 13. "Why hadn't the Woman in Black called for Raphael? Mathilde's idea that she'd stopped looking for him seemed out of keeping with most ghoststories; ghosts didn't change their behavior, did they?Whatever the reason, Caitlyn was glad of it. Raphael was hers, and she didn't want to share him. She hated the idea of a long-lost lover roamingthe halls of the castle, looking for him. It meant there was someone else in his life.She was, she realized, jealous.That's stupid! How can I be jealous of a ghost, over a guy who might not even exist?And yet, there was no other word for what she felt. Since the moment she'd seen Raphael riding in the valley, her heart had claimed him as herKnight of Cups"
14. "There will be another betrothal, another Mathilda. 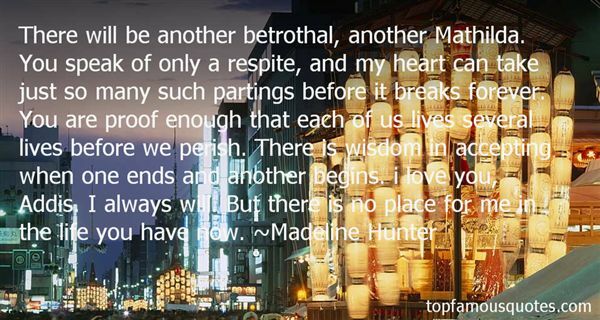 You speak of only a respite, and my heart can take just so many such partings before it breaks forever. You are proof enough that each of us lives several lives before we perish. There is wisdom in accepting when one ends and another begins. i love you, Addis. I always will. But there is no place for me in the life you have now." 15. "Neither agreeable nor disagreeable," I answered. "It just is. "Istigkeit — wasn't that the word Meister Eckhart liked to use? "Is-ness." The Being of Platonic philosophy — except that Plato seems to have made the enormous, the grotesque mistake of separating Being from becoming and identifying it with the mathematical abstraction of the Idea. He could never, poor fellow, have seen a bunch of flowers shining with their own inner light and all but quivering under the pressure of the significance with which they were charged; could never have perceived that what rose and iris and carnation so intensely signified was nothing more, and nothing less, than what they were — a transience that was yet eternal life, a perpetual perishing that was at the same time pure Being, a bundle of minute, unique particulars in which, by some unspeakable and yet self-evident paradox, was to be seen the divine source of all existence." 16. "Naturally, we are inclined to be so mathematical and calculating that we look upon uncertainty as a bad thing...Certainty is the mark of the common-sense life. To be certain of God means that we are uncertain in all our ways, we do not know what a day may bring forth. This is generally said with a sigh of sadness; it should rather be an expression of breathless expectation." 17. "A sad fact, of course, about adult life is that you see the very things you'll never adapt to coming toward you on the horizon. You see them as the problems they are, you worry like hell about them, you make provisions, take precautions, fashion adjustments; you tell yourself you'll have to change your way of doing things. Only you don't. You can't. Somehow it's already too late. And maybe it's even worse than that: maybe the thing you see coming from far away is not the real thing, the thing that scares you, but its aftermath. And what you've feared will happen has already taken place. This is similar in spirit to the realization that all the great new advances of medical science will have no benefit for us at all, thought we cheer them on, hope a vaccine might be ready in time, think things could still get better. Only it's too late there too. And in that very way our life gets over before we know it. We miss it. And like the poet said: The ways we miss our lives are life." 18. "I think of myth and magic as the hieroglyphics of the human psyche. They are a special language that circumvents conscious thought and goes straight to the subconscious. Non-fiction uses the medium of information. It tells us what we need to know. Science fiction primarily uses the medium of physics and mathematics. It tells us how things work, or could work. Horror taps into the darker imagery of the psychology, telling us what we should fear. Fantasy, magic and myth, however, tap into the spiritual potential of the human life. Their medium is symbolism, truth made manifest in word pictures, and they tell us what things mean on a deep, internal level. I have always been a meaning-maker. I have always been someone who strives to make sense of everything and perhaps that is where my life as a storyteller first began. Life doesn't always make sense, but story must. And so I write stories, and the world comes right again." 19. "In life two negatives don't make a positive. Double negatives turn positive only in math and formal logic. In life things just get worse and worse and worse." 20. "Mathin had taught her patience, and she had known all of her life how to be stubborn." 21. "When you do the math and examine how much energy is produced per atomic union, you find that fusing anything to iron's twenty-six protons costs energy. That means post-ferric fusion* does an energy-hungry star no good. Iron is the final peal of a star's natural life." 22. "Jack stares at me blankly. ‘A what?' he asks. I choke back the laugh. ‘A boy. You know? A Y-chromosome holder? You don't seem to notice them as much as you do the X-carriers.' ‘What are you talking about?' Jack asks, ‘A boy? She's just a kid.' I hesitate, wondering how Jack is only just doing the maths on this one now. ‘She's seventeen. She's not a kid anymore.' Jack looks like he's about to go all Incredible Hulk and burst out of his clothes before rampaging through the bar. He jumps off the stool. ‘If any boy ever lays a finger on my sister, I'm going to kill him,' he says. Again I stare at him in silence, thinking of all the girls Jack has laid fingers and much more of his anatomy on besides. Poor Lila. If she ever wants to have a shot at a normal life, as in one that doesn't require a vow of celibacy, she needs to stay in London." 23. "Higher degree of equations in maths and life have no real solutions." 24. "Think of those fingers as abilities. A creative person may write, paint, sculpt, or think up math formulae; he or she might dance or sing or play a musical instrument. 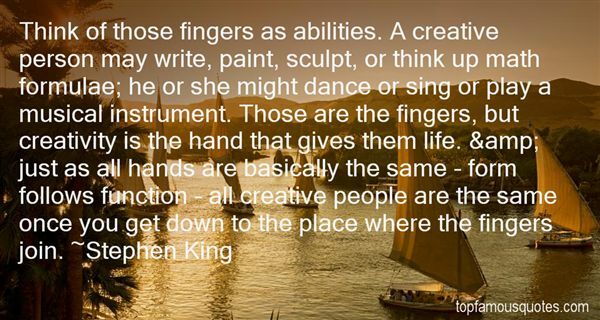 Those are the fingers, but creativity is the hand that gives them life. & just as all hands are basically the same - form follows function - all creative people are the same once you get down to the place where the fingers join." 25. "There is another physical law that teases me, too: the Doppler Effect. The sound of anything coming at you- a train, say, or the future- has a higher pitch than the sound of the same thing going away. If you have perfect pitch and a head for mathematics you can compute the speed of the object by the interval between its arriving and departing sounds. I have neither perfect pitch nor a head for mathematics, and anyway who wants to compute the speed of history? Like all falling bodies, it constantly accelerates. But I would like to hear your life as you heard it, coming at you, instead of hearing it as I do, a somber sound of expectations reduced, desires blunted, hopes deferred or abandoned, chances lost, defeats accepted, griefs borne." Advice, then, young yeoman: When referring to the king's middle daughter, state that she is fair, speculate that she is pious, but unless you'd like to spend your watch looking for the box where your head is kept, resist the urge to wax ignorant on her naughty bits." -PocketI don't know what that means, sir." -YeomanSpeak not of Regan's shaggacity, son" [...] -Pocket"